The Radionic Ships of the Heavenly Host | Negative Polarity Scout Ship Clouds. Why the Radionic Ships are here was explained a little in Starrgram 1. As also explained, they are visible mainly as Radionic Clouds and condensates, not physical objects. The meteorological community uses the apt and delightful phrase 'High Sheets' to describe their type of cloud for lack of better understanding. Now it is time to find out exactly what the myriads of different sic, 'High Sheet' Cloud reflections look like. Understanding of course that the ones shown in this Revelationnum are only a few examples per kind, and that in actuality the variations occurring daily around the planet are endless according to kind. To explain again, there are four main types of Radionic Cloud producing Radionic Ships. The different types of Ships produce four distinctly different type of Radionic Clouds, also called Radionic Fields. The different types have many possible variations, but per group each follows a few simple rules. The first two cloud types are from Negative Polarity and Positive Polarity Anchor Scout Ship magnetic Fields. The other two are from Mother Ships which have a Negative polarity and Father Ships which are Positive. Liken the Ships to a big community up there, doing everything including a Sunday barbeque. The process is simple. The Anchor Scout Ships set up magnetic environments. Mother and Father Ships plus Mobile Scout Ships run around within them. Even Radionic taxi exist, moving people from one Ship or local to another as needed. As previously stated, there are two types of Scout Ships, Anchor Scout Ships, and Mobile Scout Ships. Anchor Ships never appear as condensations, only Radionic Clouds. Anchor Scout Ships are responsible for all the vertical Radionic Cloud arrays thus far shown. Anchor Scout Ships are like harbor tug boats which are relatively small but have powerful engines. The Anchor Ships exist in Earth's atmosphere all over the planet all of the time, sitting bare faced in the sunlight as vertical magnetic monopole Clouds often visible to the naked eye. From the Third-Dimensional physical point of view, the formations always appear as a pair of monopoles one hundred and eighty degrees opposite each other, not always obvious. The Anchor Ships sit unseen in the upper level of the Fourth Dimension at the apex points of the Clouds they produce. The Clouds are the proof of their existence. A pair of Radionic monopole clouds is as previously stated, from a Positive and Negative pair of Anchor Ships acting as the respective Positive and Negative poles of the magnetic Field set up between them. The Fields are no different in principle than a bar magnet with their poles connected through the Fourth Dimensions producing the magnetic Field. The Radial Cloud lines of the Fields show the magnetic lines of force running from one Field apex to the other just like iron filings running from one end to the other around a bar magnet, only overhead. The whole polarized magnetic Field provides a local magnetic environment in which the Mobile Scout Ships and Mother and Father Ships and Mobile Scout Ship condensates mosey around getting whatever needs doing done. Nobody is here on a tropical vacation. Whenever you see an Anchor Scout Ship pair, Mobile Scout Ships, and a Mother or Father Ship or two will almost always be seen somewhere in the vicinity. The Anchor Ship Fields can be very small to very large, spanning hundreds of miles sometimes depending on the Particular Anchor Ships involved and the different types of Mother Ship or Father Ships in the Field. Inside a Field. The Mother Ships and Father Ships can be tucked in close to the Anchor Ships, or far afield like a family pooch off the leash. They can also be close together or far apart, even in different Fields at the same time but still always magnetically connected together through the higher dimensions. The same with the Mobile Scout Ships which also always project together in pairs. Magnetic monopoles cannot exist in and of themselves anywhere in Creation in any dimension. Off world, Mother and Father Ships move about by teleportation under the direction of pure thought. Likewise on Earth, in Earth's Fourth Dimensions they move about by magnetic interactions with the Radionic Fields under the direction of pure thought. The magnetic Fields of the Mobile Ships play against the pole alignment of the Anchor Ship Fields allowing them to shoot quickly to anyplace they want within in the Field. As previously mentioned, the Radionic Cloud effects of Anchor Ships are observable in the two distinct modes. The first as previously mentioned being a Negative pole Anchor Ship monopole array, the second being a Positive pole array. Once you get the idea, the two arrays are usually quite distinguishable. Anchor Ship Radionic Clouds are always recognizable as vertical radial lines meeting at an apex about ten to fifteen degrees off the horizon. Negative pole Anchor Ships are attractive in nature, while Positive pole Ships are projective. The 'draw towards it' nature of the Negative polarity usually causes the available water vapour ionnizations to concentrate into more boisterous ionnizations and condensations. The opposite effect of the Positive poles tends to create less ionnizations and condensation effects because of the 'push away' nature of their magnetic Energy. Consequently Negative monopole Anchor Ship Radionic Clouds are usually but not always distinguished by a clump water vapour attracted around the apex focal point of the Radials, plus usually a generous white flume or flumes of ionnizations or condensations up the middle area. Figure 1 - You should have seen me yesterday. Positive monopoles are distinguished by less ionnization or condensations, seen as more whispery radial lines of emptier water vapour trails which are mostly at the sides. They are usually but not always emptyish up the middle, and usually but not always do not have a white wad at the bottom. Instead, having a blue V of clear sky which is partially obscured by the building in the example below. In other words the exact opposite. Figure 2 - Look Ma, no cotton wad. The Radial Cloud lines are called radial because they emanate outward from the apex focal point like the spokes of a wheel. The basic rule is, if you see a big flume up the middle and/or a big wad of white at the apex, you are likely looking at a Negative pole Radionic Cloud. The other basic rule is that whenever you see a Negative monopole Radionic Cloud anywhere, the Ship's Positive pole partner will also always be present, no exceptions, sitting either seen or unseen exactly one hundred and eighty degrees in the opposite direction. You basically have a bar magnet going on but in the upper fourth dimension. The Fields are connected by whatever stuff the ethers are made of instead of through the molecular jiggery pokery of Third Dimensional metal. The reason the word 'usually' is used to apply to the two above rules is that all bets are off about what you might actually see at any time in an actual Radionic setting sitting overhead. Like people, no two Radionic Clouds ever look exactly alike. They may look similar often enough, but never exactly the same. Some, in fact can be quite the head scratcher trying to figuring out its gender. On the whole however, two or more Clouds can look very similar in their general aspects according to the rules, but can be decidedly different looking according to their particular nitty details. In Radionics there are only a few principles but many many practices. The Negative Cloud examples in this Starrgram will show this fact abundantly. Radionic Cloud occurrences have been going on around Earth since before Biblical times. The many references to 'Clouds' in the Bible are not talking about fluffy little cumulus puffs. Radionic Cloud presences took a big up tic in the mid-fifties, then a really big up tic in April of two thousand and sixteen, then a really really big up tic in the summer of two thousand and eighteen. Where there used to be thousands of Ship teleported into Earth's atmosphere at any given time, now there are hundreds and hundreds of thousands. Many of the photographs herein have come from the known hand of someone holding a camera including this word smither. The rest are from the Internet, mostly by Google and Bing Internet searches for 'sky', 'clouds', and 'chemtrails' etc., conducted by this word smither. Plus some were also found by simple 'stumble across' while surfing the Internet from time to time. A few others have come from assorted media sources such as movies, News broadcasts, TV shows and even magazines, also discovered by this word smither, usually by stumble across. In the ones from the Internet searches, the pictures are often quite small in their original form to save space on the host servers. When blown up to fit these pages some have tended to turn pretty guffy and out of focus, despite the best efforts of the enhancement programs used to improve them. A couple of panels at the end of Starrgram 16 show the efforts done by the enhancement programs to make these examples viewable. In some cases, the point being shown wasn't even visible in the photographs until after enhancement. Similarly, in all cases when the date and location are known they will be given. That's half the fun. Since dates and locations are usually not given with the Internet search photographs, the dates and locations are not given unless otherwise available. If you see video controls across the bottom of a photo you'll know it came from something like 'YouTube'. The good news for everyone is that the Internet photos prove unequivocally that the Radionic phenomenon is world-wide, because anyone of them could be from anywhere on the planet at any given time. Even from many years ago. Why not. A photo taken today takes no more effort to post up in Google of Bing than one taken in the eighteen hundreds. One of the photos in this Revelationnum is even from a research station in the Artic, another off an Island Paradise somewhere in the Pacific, yet another from Boulder, Colorado in nineteen sixty nine. Similarly, when possible, the direction the view was in is also given. It may become a bit of a 'Enough Already', but it is done to build up an evolving picture of the uniformity of their presences. They do not occur willy nilly all over the place, but tend to stay within a regular and systematic alignment with Earth's magnetic Field. Most of the photographs in this Revelationnum are not magazine crisp, were it only otherwise. Most of the live originals were taken on a cell phone. Some were pretty good. Others because of overcast, haze, poor lighting, inept camera handling, and other not so good Kodak moment activities are way past rough in the rudest. However, a deft combination of Adobe Photoshop, Corel Paint Shop Pro, Movavi Photo Editor, NCH Photo Enhancer, and Cyberlink Photo Director saved the day in most cases. At least you get to see what you are supposed to. The photograph below is a good example. It was taken in a number of shots by a disposable camera in Ottawa, Ontario in the spring of nineteen ninety four and patched together using scotch tape. It was eventually scanned into a .gif image and the originals long since lost. Inexperienced enhancing attempts over the years degraded it even more, but at least the point gets made.. It was badly meddled with many times since through inexperience and has come out looking rather rat chewed. As rough as it looks however, it still manages to keep itself in one piece enough to make the point. It is without any doubt whatsoever a Negative Polarity Radionic Cloud reflection. In this case looking towards the North West. As you can see, the bottom is filled with a cotton wad, it has large flumes of ionnized cloud running sort of up the middle, and has feathery lines of ionnizations. This is a typical Negative Anchor Ship array fulfilling all of the signature requirements. To remind you again, you are looking at the Ship's upper Fourth-Dimensional magnetic Field reflected within the ionnized cloud vapors of the third dimension below and not the actual Ship itself. 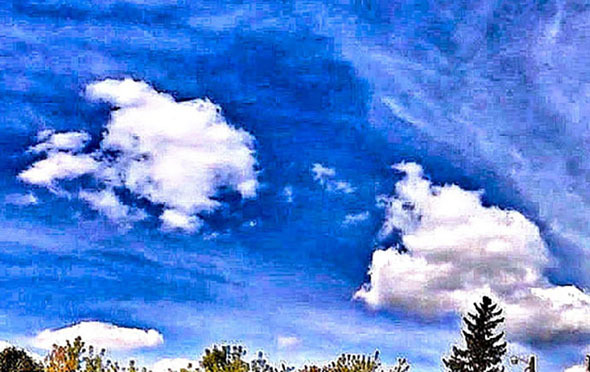 The Ship is in the Fourth Dimension at the apex point just above the tree You know the Ship is there because there isn't anything else around, either in Nature or by the hand of Man, that can produce this particular kind of cloud effect. The Field just tells you for a certainty that somebody is in something up there. To remind you again, the Radionic Anchor Ship is sitting unseen in the upper fourth dimension where the radial lines meet at the focal point. Figure 3 - Ottawa is cool, you should go there someday. You might even run into a Senator. A better example from off the Internet shows the assorted features much better. Particularly the bottom which is more often than not blocked or covered by something. Figure 4 - That's better. I am what I am. What I am in the Figure below, is like the Figure above, namely another Negative pole Radionic Cloud sitting up high so in close as the following image from the Internet shows. The higher up the apex, the closer in the Field. The Sea Horses came along for the ride. Figure 5 - Swing low sweet chariot. Although the Radionic Cloud appearances in Ottawa were numerous over the next twenty years, this wordsmither took no further photographs. Not for lack of opportunities but because the mood for disclosure became suspended and there was no compelling reason to continue taking photographs. Then in early February 2013, this wordsmither moved to Brantford just West of Hamilton, Ontario just North of Lake Erie. 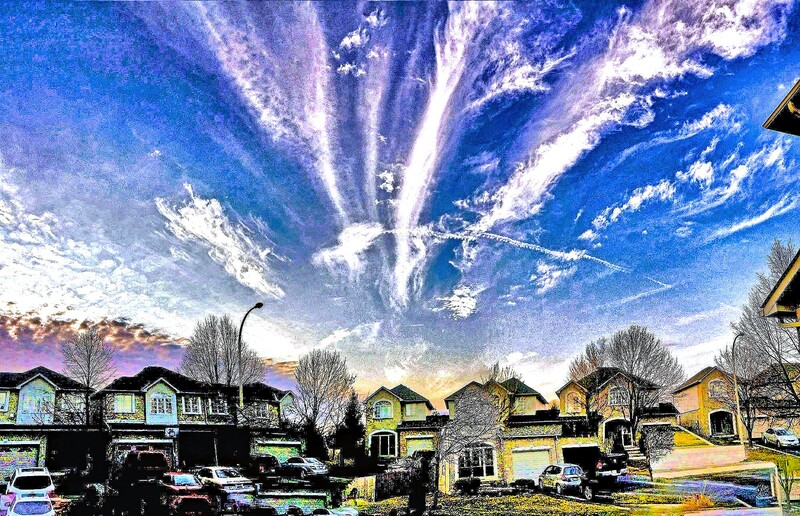 After leaving over thirty two years of Ottawa behind with consistent Radionic activity in the sky all of the time over the years, absolutely nothing appeared in Brantford's skies for nearly fifteen and a half months. Not even a noteworthy measly streak of ionnization except from time to time when the jet stream came meandering through. Suddenly out of the blue, on May 14, 2014 a perfect Radionic beauty showed up sitting just outside this wordsmither's back door looking to the North East. For no other reason except brain deadness, no photo was taken. Then on June 20, 2014 another Negative Radionic Cloud appeared out back and the photo below was taken by cell phone and the game was afoot. It is shown herein more because it is a vested part of the history of this Revelationnum than as a good example. With no feathers, the bottom radials sitting mostly behind a patch of lower cloud cover, and very little in the way of ionnized water vapour in the background this probably is the lamest looking Negative pole Radionic Field in the history of Radionics. However it does have a saucer shaped Mobile Scout Ship condensate sitting at the edge of the cloud at the center right. Proving unconditionally that it was a bonafide Radionnic event. Also helping unconditionally to mark the official start of this Revelationnum. Despite the fact that it was not a stellar example of a Negative pole Radionic Cloud, it also had the one thing ordinary clouds never do. Namely, a Positive pole partner sitting visible at the same time one hundred and ninety degrees in the opposite direction to the South West. So no getting around it, this had to be the Negative pole side sitting over here, because duhh, the Positive pole side was sitting over there. Nothing like fuzzy logic to make everything come out clear and simple. It is very uncommon to see a brother and sister Anchor Scout Ship pair visible at the same time. The assorted photographs in this Revelationnum which do not have a partner pole opposite, are either because both were not visible at the same time, or one or the other was too poor to use, or nobody thought to look in the respective opposite direction.. In any case, the Figure below is borderline to be sure, but considered good enough to make the point because it is an important partner in the first Brantford pair of photos ever taken and marked the start of the amazing World Wide adventure this Revelationnum is destined to become. Figure 6 - There's a what? Where? From this point on, this Revelationnum project was definitely back on track. And like the original early days in Ottawa, this word smither was imbued with motivation most sore to watch the skies for Radionic Clouds on a regular basis and keeping a photographic record. Under the new enthusiasm, another photograph was taken on July 5, 2014. This time from the front door of the same house, this time looking to the North West. As the Figure below shows, the Field was just getting going. The cotton wad effect and flume up the middle however are both obvious. 'Just getting going' means either that the Ship had just settled in and the outgoing Radial lines had not yet had a chance to stretch out, or the proper kind of water vapour needed to reflect the whole magnetic Field was just starting to move in. In this case, the fact that the ionnizations are more or less uniform across the whole formation suggests that the Ship had just settled in and the Field was just starting to spread out. If it had been from vapour moving through, usually the side of the Field where the moisture is moving in will be gung ho with the other half where it hasn't got to yet still having nothing. The reverse is when dry moister air is moving in. The incoming side will be blank while the leeward side will still be busy. One or another of the photos in this Revelationnum show one or another of these two different effects. Dates whenever available are from the original timestamps embedded in the photos. Figure 7 - I just got here, give me a couple of minutes to my head together. Sometimes a Radionic Field will last for hours. On the whole though, due to the come and go nature of ionnizable water vapour passing through, like Brigadoon, Radionics Fields tend to be very will-o-the-wisp. A beauty can be up overhead now and twenty minutes later all but vanished after the water vapour has finished moving through. Sometimes they can be in and back out again in just a few minutes. They can do this on and off sometimes for days on end, never moving from their original spot even as the water vapour originally reflecting them has long passed through on the way to England. Also, to give you an idea of how the 'Now you see it now you don't' nature of Radionics works in general over an extended time frame, one week later on July 11, 2014 a fully formed Negative Radionic Field beauty popped up at the exact same location as the Figure above. Whether it was the same Ship or a new one only the fleet Commander knows. The view below was taken a bit further back up the street, but notice the same traffic lights, convenience store, and the left end of the Church. Also, you should know that twenty minutes before there may have been nothing, twenty minutes later it could have had that empty feeling a bus stop has just after the bus has passed and you missed it. Actually there is more to it than that. Radionic Ships are also good at producing great blink experiences. They have the ability to precipitate a horizon to horizon blanket cloud cover over themselves in just a matter of minutes. On occasion sometimes, even in just five minutes. After a perfectly clear sighting has been present for awhile the sky will suddenly be covered by a standard cloud cover from horizon to horizon. Even clouds in a Category 5 Hurricane don't move in that fast. For their own reasons, the Ships involved will have decided to mask their presence with a cloud cover for the time being. Hours later, the Radionnic clouds could be visible again, done the same way, i.e., no time for the cloud cover to have drifted away. Also the reverse is true. At fist nothing but wall to wall overcast. Then suddenly a beautiful Radionic Fields with the overcast gone. Then suddenly nothing again but overcast. Literally a 'Blink you missed it' experience. Figure 8 - No one feels closer to God than someone singing hymns in a Church. 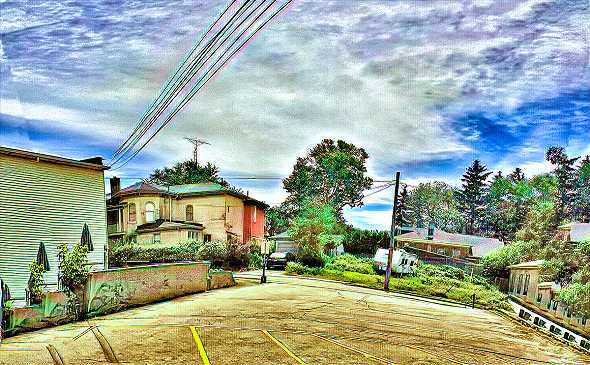 Then on September 29, 2014, another Negative pole Radionic view appeared out back of the same street address, looking somewhat like the Figure above only looking to the South West. Figure 9 - Full of mysteries I am I am. As some of the above Figures imply, Anchor Ship Fields and Mother can sometimes fill the whole sky. Mobile Scout Ship condensates are usually too small or too diffuse to be seen by the naked eye. The photograph above reveals that a Negative and Positive Polarity pair of Mobile Scout Ship condensates was sitting at the center right and upper right. Similarly, smaller Mobile Scout Ship condensates usually show up later when the photograph of an Anchor Ship Field is blown up. A blow up below of the Figure above now shows a slew of different kinds of Saucer shaped and Spherical shaped Mobile Ships sitting clearly in and around the white cumulus clouds at the center left. The Mobile Ships sit in and around in cumulus clouds completely unseen by the naked eye. They are also capable of precipitating their own fluffs of cloud if necessary. They are not cloaked as clouds, they are cloaked by the clouds. The Figure also shows two larger Mobile Scout Ships sitting out in the open within the arms of the Radionic Field at the right. The ships were not visible at all in the original photograph before the enhancements. Mobile Scout Ships and their behavior are discussed in detail in Volume II, already in the works. Figure 10 - Well I'll be darned. The Following Photograph off the Internet has somewhat the same basic Negative Polarity Field outline as Figure 9 above, but a lot more of it. What it also has are a lot more of are Mobile Scout Ships of all kinds, particularly at the right and left sides plus a couple of bigger ones in the open area at the lower middle. Figure 11 - Yup, them's little Ships alright. This word smither's street address turned out to be quite the busy place for Radionics. Not forgetting there could also have been lots more going on but just not noticed at the time. Nonetheless, on December 20, 2014, another Negative pole reflection was observed again out back, yet again looking to the South West. Notice again the same pine tree as in Figure 9 above. Notice also that this one is more of a look alike to Figure 6 above, but now in the opposite direction. The polarities within their favored alignments switch on a regular basis. The polarities are not fixed, just the alignments. Figure 12 - Fwee Rillie, the Chinese Porpoise Movie never made. Speaking of cottony wads, the following image below has to impress. In the winter of 2015, this word smither moved temporarily to Paris, Ontario fifteen kilometers North West of Brantford. The photo below was taken on March 6, 2015 in Paris. The view is to the North East looking back over top the Paris street house from the driveway out front. The cotton wad at the bottom and ionnizations up the middle shows it to be without any doubt whatsoever a Negative monopole reflection. Figure 13 - Are bailing a ball of cotton and balling a bail of cotton the same? Then for reasons way to long and way too irrelevant to explain, a few days later this word smither wound up back in Ottawa for a couple of days. Lo and behold, Radionic Ships were still hanging around. 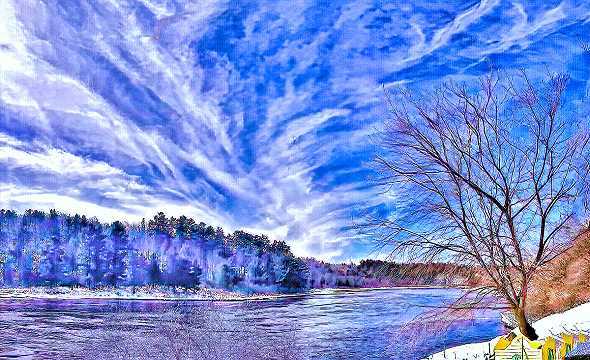 The following Negative Radionic Cloud was photographed on March 10, 2015 up the Gatineau river just across from downtown Ottawa. The view was to the North West. This was also a tough one to get out in decent viewable form. Mr. dumb cluck at the helm had set the cell camera to video by mistake, and the original side by sides were all over the map. But look at how strikingly similar it is to Figure 9 above, despite being five hundred and fifty kilometers away and six months later. Figure 14 - Glad to see you finally made it back to town, We were beginning to wonder where you'd gone. And then along came some musical chairs in Paris. After appearing in the North East as per Figure 13 above, on April 12, 2015, a decidedly Negative pole Field suddenly appeared in Paris swung all the way around to the South West. Which represents a complete pole reversal of one hundred and eighty degrees in the opposite direction. It was taken basically as though looking straight across the street from Figure 13 which had been taken looking looking backwards over the house. These polarities really like to flop around. This time it was a very well flushed-out bonafide Prima Donna Negative Pole beauty, saying it all, also shown as Figure 1 in Starrgram 1 as the first Radionnic example. Figure 15 - Peacock City coming. Paris in fact turned out to be quite the scene for Radionics during the few months this word smither was resident there. In fact, it still is. Go out to Paris pretty well anytime and chances are there will a decent looking Radionic Field sitting up there somewhere. The really decent Negative pole Radionic Field below was photographed on October 15, 2016 on the East side of Paris about two kilometers before town about a year after this word smither had moved back to Branford. The view is looking straight to the North West. Unfortunately, lack of prevalent water vapour prevented any view of the Positive pole Field in the opposite direction at the time. Figure 16 - Ahh, the sweet smell of country air, can't wait ti'l the wind swings around from the barn. 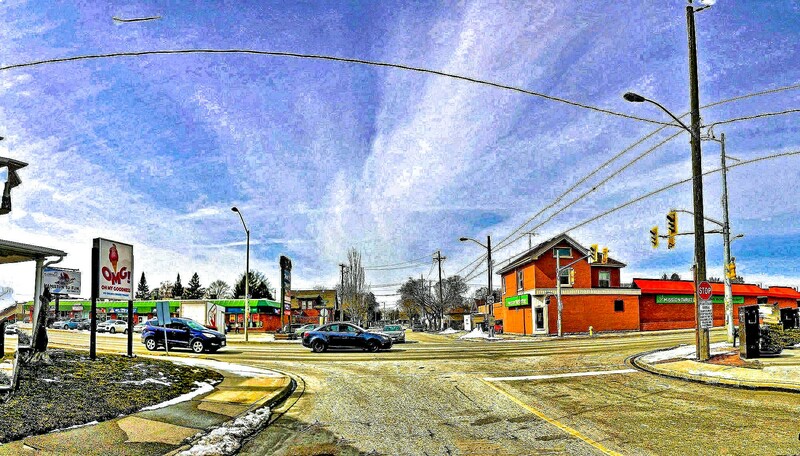 Seven months after Figure 12 above had been photographed, this word smither had moved back to Brantford to a new street address just down the street from the old street address, and took the following very decided looking Negative monopole photograph on October 22, 2015. As the Figure below shows, this one sported the best flume up the middle ever. The view looked to the South West, same as Figure 15 above in Paris. Figure 17 - Vesuvius took one look and blanched. Because patches of ionnizable water vapour usually don't stick around for long when moving through at a steady leisurely pace from West to East, it is highly unlikely to see both sides of Radionic Anchor Ship pair at the same time. Usually, if you watch the passing areas of ionnized water vapour for a while, you will see a pocket of moisture vapour creating good visibility at one pole, see it move slowly along and suddenly start giving good visibility at the other pole in the opposite direction. Even as the original has started fading out. This is the trick to Radionics. If you see a Radionic Field, always look in the opposite direction for its partner. If nothing is up, wait a bit and check again. If you are lucky you will see both at the same time. Usually what happens though is that the first is already starting to fade out even as the second is starting to come in. Similarly, a Radial array may be perfectly visible in the morning, then not again for a couple of hours or even days through lack of proper ionized cloud moisture. Then suddenly be visible again still in the same location. Similarly, nothing might be observed for a month or so as the Ship has departed. Then suddenly the same Field will start up again after it returns or another in its place. Radionic Cloud effects are very inconsistent in nature and vary widely in practice. 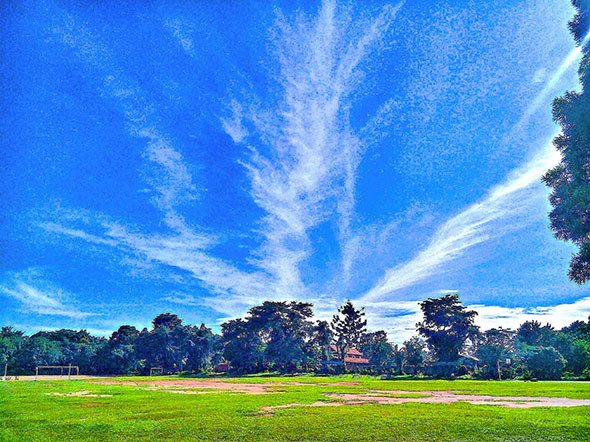 What is consistent is that the Radial lines are always composed of feathery peacock tail and ionnized cloud like effects that meet at an apex. And usually in one or another of the same favored locations. 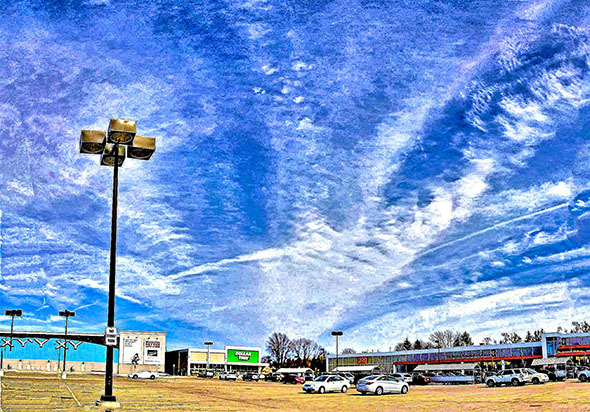 Many months along, after seeming to be on a loosely hanging 'Here today and gone tomorrow' basis in Brantford since mid May of 2014, starting on April 19 of 2016, things suddenly fired up a couple of notches and Radionic clouds suddenly started coming out of the woodwork in a significant up-tick in the unfolding of Earth's Cosmic events. World wide too, all visible or not depending solely on the available water vapour present and who was hanging around outside at the time to see it. The difference was that before, Radionic ionnizations of any amount were only visible from time to time in Brantford. After April 19, 2016 some form of Radionic presence was visible nearly all the time with only occasional blank gaps. A consequently very regular appearing Negative Polarity Field was first observed in Brantford about eleven AM in the morning of April 19, looking to the South West, which started it all off. The focal point was quite high up so the Anchor Ship was fairly close in. Who knows how long it had already been up. It was around eleven in the morning when first noticed by this word smither. Figure 18 - It's nice to be back. It's nice to be anywhere. At the same time as the Figure above was setting up looking to the South West, a new second Field was setting up looking to the South East. At the time it was very poorly formed. About two hours later, as seen from Brantford's North East plaza not far away, it had firmed right up. As you can see from the photo below, the two do not look even remotely alike even though both are Negative Polarity monopoles. A slight overcast covers covers the bottom. To remind you, water vapour, wind, and the mores have everything to do with what you might see at any given time. The main flume is off to the side in this second one, and the bottom cotton wad is not overwhelming suggesting it might be a Positive pole. However, in this case, the Positive partner was also visible and way more Positive. So Negative pole it is by default. That's called deduction by first Principles, also known as 'Ok, if you say so'. Also, these magnetic Fields sure know how to dish it out. The corkscrew up the middle is in fact a Contrail caught in its grip. Also please note, more often than not Branford's skies tend to be slightly muggish and hazy from warm air up from the Gulf. 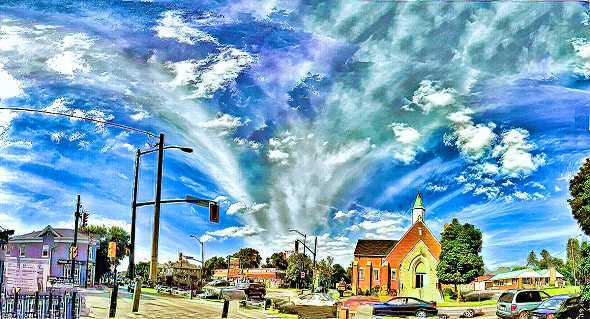 A lot of the Brantford photographs therefore tend to have a slightly brackish look to the sky instead of clear blue. Likewise, some of the cloud arrays in this Revelationnum were stupendous wall to wall events. In order to get as much of it in as possible, side by side snapshots were taken. as mentioned, from a same foot on the ground location. Turning like a Lazy Susan when clicking from side to side. Like the front end of an oscillating fan which does an arc as it sweeps from side to side, the camera does an effective identical sweeping curve going from side to side. When PhotoMerging the side by side stills later, the bundled in curve gets pushed back out by reverse osmosis to the front. 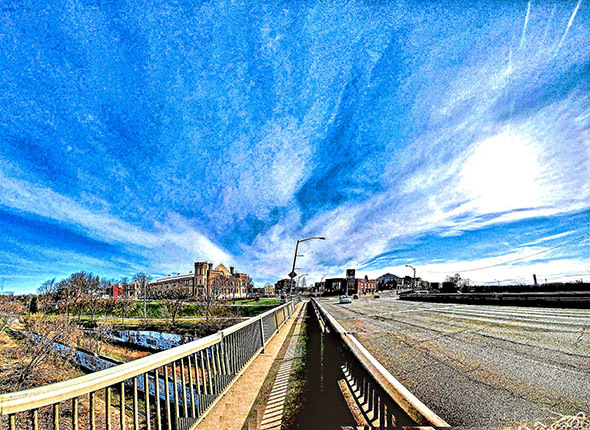 Hence the space-time curvatures in the foreground of some of the PhotoMerged photos like the one below. It all depends on the number of snapshots taken. A lot of shots equals a lot of frontal curvature. Only a few means only a little. In the case of the following below, a fair bit. The background and cloud arrays themselves get off Scott free because they're always at the focal point of attention and are sometimes kilometers away. So are not subject to the curvature, which has strictly to do only with the up close foreground stuff. Figure 19 - Remind me never to fly through there again. Finally, to prove the extreme unusualness of the situation, both in how long the Field had endured and in how fast the tables can turn and a completely new morph appear, a yet second shot of the same view was taken from Brantford's main far North West plaza. This time in the early evening. By now a whole pile more of just the right kind of ionnizable cloud vapour had moved in and the Field went completely bonkers. Looking yet completely anew yet again, yet still completely right on the money for a Field of Negative polarity ilk. By now you should be getting the idea of how no two views are ever the same in practice even as they are always alike in principle. It's a Cosmic truism that for every principle there are a thousand practices. In Radionics, particularly true. The Northern Lights are the same. It's all just a matter of which end of the equation you're looking at, the Principles end or the Practices. In this case, these photographs all represent practices, but collectively they are all respectively the same in Principle according to rule. Figure 20 - Gadzooks, I've gained twenty pounds since lunch. Thus far Brantford, Ottawa, and Paris viewings have been coming out your ears. These are not the only ones that ever occurred in these places. These are only those which happened to get noticed by this wordsmither or others when out and about, or were good enough to qualify as examples. No doubt countless other good opportunities went by unnoticed because of overcast sky, not being out of the house, nighttime, and umm, of course not having the cell phone handy. Also to point out, these were not the only times this writer was out of the house. It's like they're there, you're not out there, you're out there, there's nothing there. Then bingo, you're out there and there's also something up there and now there's another photograph. Similarly, Brantford, Paris, and Ottawa are not the only places where Radionic Radiations like these are, and/or have been, and/or ever will be present. As earlier stated, Radionic Ships are all over the place all of the time. The one at the top from Ottawa is a case in point. To prove the point even more, the following decidedly looking Negative monopole image was taken in downtown Kampala, Uganda on the 9th of April, 2016 by a friend of the cause. 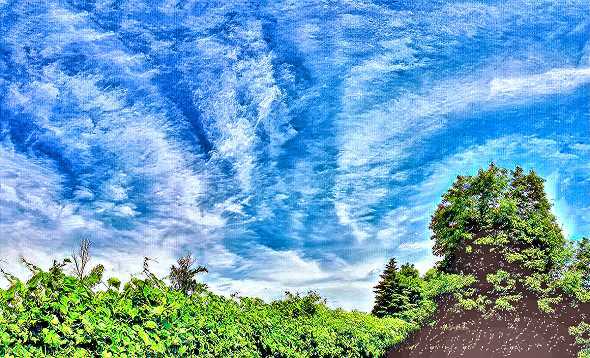 The photo shows what was described by a friend of the friend at the time as sic, 'Branches in the clouds'. Actually not that bad an impromptu interpretation when you think about it. Figure 21 - I shook my branches and out fell a Ship. Wait, What! Our 'Hip to the trip' Kampala friend also sent along the following very similar looking Negative monopole which had been photographed on December 5, 2015. This time it was about thirty five miles from Kampala near Lake Victoria. Look at the corkscrew flume up the middle. Something really seems to like screwing these around. Actually go back and look at Figures 7 again. If that isn't screwy nothing is. What is all this screwy stuff going on with these Radionics things anyway. Blame it on their magnetics. Scientists have been looking at magnetically induced atomic particle spirals in Cyclotrons for years just to tell what kind of atom fragment they're looking at. All that is needed now is for someone to crack the code and tell where an Anchor Ship is from just by looking at the kind of spiral it makes. Figure 22 - I'm from the deep south. My Cousin's name is Fare Tornado. To show the Universality of the sightings once and for all, some of the following photographs are from around the World. The first is from Sao Paulo Brazil. Figure 23 - Whenever I think of you I think of Rio. The next Figure below was taken on April 19, 2017 by another friend of the cause back half way around the world again in Paris, Ontario. Except for being less feathery, not spun like a corkscrew, and tilted a bit to the right look at how similar it is to Figure 22 above. The photo was taken looking in a South West direction. A similar somewhat skinny Negative Radionic Field leaning the other way was photographed on January 11, 2013, again on the Shore of Lake Victoria near Kampala. Again by the friend of the cause. Figure 25 - I'm on the 'Blue Sky' diet. No clouds till after lunch. Then from the same house in Paris on the 26th of June, 2018, fourteen months later, by the same friend of the cause, a filled out beauty of a Negative Pole Anchor Ship Field was photographed looking up the same street in the same direction as Figure 24 above. This time the trees had leaves. The tell-tale is the Hydro Utility panel sitting on the front lawn at the bottom center. You might also notice that this is about as good a flushed out Negative Pole Radionic Field as it gets. Figure 26 - Forget the diet, big clouds are good. The next example of a filled in Negative pole Field below is included not because it is an outrageously good example of what a Negative pole Radionic Field looks like, but because of a little bit of Cosmic irony taking place on the day it was photographed. The image was photographed out back of the Best Western Motel in Brantford in mid-morning of June 27, 2016. At the time, nearly two hundred people from all around the world were inside listening to talks about Ufo sightings and related stories about abductions, in what was billed as the 'Alien Cosmic Conference'. The Conference ran from June 25th to the 27th. The Conference featured the same old speakers, talking about the same old stuff, to the same old audience, with their same old note pads, harboring their same old anticipated beliefs. Really serious stuff, quivering upper lips and all that. Ears straining to hear every word said about everything Mankind likes to think they know about Ufos. Which were wafting across the conference room hall like high octane elixir for those who are ever looking and always hoping to know. The media was there, videos and interviews were being taken, million dollar smiles were flashing in the direction of every camera, reputations were being established or shot down, and equitable alliances were being made across every coffee table in the place. One guy even stood up and dared the US government to disclose all the information they have about Ufos based on ten big thick confidential documents about the matter held in their possession. Professing to contain all the information the Government supposedly ever knew about UFOs, plus probably also, ever might. How on Earth he got all that info is anybody's guess. The Expo was a huge success, so huge that next year it was held at one of the leading International Hotels by the Toronto airport. It now has wings of its own and still doesn't know anything whatsoever about Radionic Ships. The whole show of course was about the tin pots, dealing exclusively with suspicious little blips in photographs and twinkling lights in the night sky. All described and presented in minute detail to an eager audience wanting desperately more to believe. Even as they all continued to be completely in the dark about the vastly greater Radionic Reality going on right under their noses, including outside in back of the hotel. This word smither had been refused an opportunity to speak at the Conference for being considered by the promoters to be sic, too far below their level of seriousness. A little bit of Cosmic humor right there in it's own right. The only person in the world who had even a bit of new information about the matter let alone being appraised of the whole show, they had said no to. The World Wide UFO alliance Mufon (Mutual UFO Network) however, was there in abundance. Now these are the ones with real juice. If you want to know anything about the tin pots, someone from Mufon is the one you want to talk to. You have to understand how this UFOlogy thing works. Somebody catches a little blip of something zipping by in a video. The video is sent to Mufon or another such affiliation of self acclaimed Ufo specialists to confirm or not whether it was a real sighting or not. After weeks and weeks and even months of intense study, subjecting it to every test known to Man, the heads get together and opine that, 'Yes, it appears to be a legitimate sighting'. And just like a new found statuette of Jesus with moisture condensing on it like falling tears pumps up every devout Catholic around the world into believing in the Reality of Jesus yet one more tiny little jot, ardent UFO fans around the World rejoice in new found excitement at the pronouncement. But what has really just happened here. A couple of self-proclaimed experts concluded that 'yes' it probably is legit, which still in no way whatever actually proves that it is or it isn't. It only proves that a collective had been sequestered and an opinion had been rendered. Nothing else is therefore known or learned about it whatsoever. Like what it is, why it is, where it is going, what it is doing, who or what might be in it, and what or who else might be accompanying it. And so it goes. In other words nothing came out of all that effort except a single dry little cornflake. Such are the bread and butters of such UFO Conferences held yearly around the world. Compare that with what you have read so far in this Revelationnum. This Revelationnum officially started out as a simple little presentation of a few dozen photographs presented at a table in the hallway at the Conference. Best location in the house mind you, but still outside the inner court where all the main action was. Nonetheless, the simple little table presentation has now morphed up into this fully fledged official Revelationnum presentation and not a moment too soon. The really fun part is that of all this is that while the lectures were going on, this word smither had slipped out back and taken the photograph below. A patch of grey cumulus cloud partially obscures the middle of the photograph, otherwise it would be have been an absolutely stellar Negative pole example. Wonder what's going on behind the tree, it's in the original photograph. That's not a flashlight waving around back there. Figure 27 - What're you all doing inside, the real action's outside. Conferences aside, who knows where this next, likewise more filled in Field from the Internet is from, but it obviously isn't from Brantford. The sailors of yore probably saw these and hit the deck. Figure 28 - Baton down the hatches boys, looks like we's in for a wind. Speaking of wind, how about a Category 2 or 3 hurricane. The following image from off the Internet was taken around September 12, 12018, at Myrtle Beach, South Carolina near where Hurricane Florence was expected to make landfall. Obviously somebody was expecting the worse. The Negative Pole Anchor Ship Cloud in the background is already starting to take a beating. At least somebody took the time to frame the photograph though. And did a good job, look at where the top floor of the house sits. Figure 29 - Forget the barbeque folks, for sure we's in for a wind. While roaming around Canada, why not also Nova Scotia. The following Internet photo from an unknown time is from Halifax, Nova Scotia. Don't know what the photographer was after, but they sure did get a nice Negative Pole Radionic Field sitting overtop the apartments. The fact is that the number of Ships teleporting in on a daily recently has recently skyrocketed. Two years ago, except for searches, you could surf the net for days without coming up with a decent Radionnic cloud. Now circa, August, 2018, you come across two or three a day in adds, articles, i.e., anywhere. Meaning, that people are still taking photographs like before but now the sky is likely to have a Radionnic Cloud in it no matter where. And forget about Facebook. People are putting up new pictures in there all the time, so bingo. Just image what things might be like ten years from now. You might not see the Sun for all the possible Radionic Clouds in the sky. Which would be a good thing if global warming keeps going up and cloudy skies would help keep it down. Figure 30 - How the heck did global warming get into this. It has also been mentioned that the characteristic feature of an Anchor Ship Radionic Field is that the Radials meet at an apex point ten to fifteen degrees off the horizon. The problem with in-town viewing is that the apex area is usually covered by trees, houses, buildings or a fat thumb on the camera. No such problem on the open Prairies however, where a ten foot tree can sometimes be a local landmark. So yup, the following open Prairie Figure below of a Negative Pole Radionic Field looking a lot like Figure 16 above shows a bottom apex in all its glory. The picture had been taken on May 15. 2017 just east of Bossano, Alberta by yet another friend of the cause living in Medicine Hat, Alberta. Bossano is well into where the Prairies start and don't stop until Winnipeg, Manitoba over thirteen hundred kilometers to the East. As you can see, no trees, no houses, no buildings and no thumb. So yup. the apex is completely free and clear at least fifteen degrees off the horizon. Like Brantford and Paris, Santa Clarica just North of Los Angeles is no stranger to Radionic Ships. 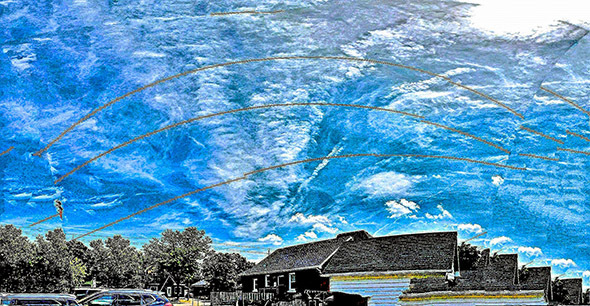 As the following Internet Figure shows, a similar Negative Pole Radionic Field to Figure 28 above sits just behind somebody's house, showing at least enough stuff to have gotten itself photographed. Figure 32 - Nice cloud, sets off the house. The location of the next image is well known to some. It is no less than Vancouver's World famous Wreck Beach. sitting right below Vancouver's World famous University of British Columbia, sitting right at the top of the very tip of Vancouver's World famous West Point Grey's bluffs, sitting right at the extreme Vancouver's World Famous West End. The view is to the South alongside where the Fraser River dumps straight into Georgia Straight. The image came off Google Earth by clicking on one of those funny little red balloon-like markers it used to have all over the place so you couldn't see anything. The original idea was pretty good, showing landmark photos of interest in a particular local. But somebody seemed to get carried away with the idea and now all you see in some places is balloons. Wreck Beach though is way more famous for activities other than Radionic. In the early sixties, Vancouver started up a Hippie community which ended up with the second largest long haired population in the World outside of San Francisco. Sporting long hair wasn't enough, some of the Hippies but not all, also wanted to sport no cloths. Since Wreck Beach was not all that easy to get to despite being right there below the University, at some point during the later sixties some of the Hippies decided to make it their designated la la land location for going a' la la, much to everyone else's concern and/or delight including the Mayor. The popularity quickly spread to include feverish tourists, who flocked to the beach in droves hoping to see private parts they were not normally privy to. The authorities were a way more than a little bit ticked off as it went right against the grain of everything they had sworn to protect, uphold, and believe in. Who relentlessly tried to shut it down. In two thousand and seventeen, despite all efforts to cover it up with a wet blanket, Wreck Beach was still evidently going strong, sporting a now in fact annual, no kidding, 'Bare Buns Run' along the sand. Now isn't that an image to savor. In the photo below everybody is wearing coats so it was probably taken in Vancouver's fall or mild winter. Figure 33 - Bummer, where did all the running buns go. It was similarly proven that Ottawa was still going strong around 2017. The Figure below was taken on January 15, 2017 by an Ottawa friend of the cause. The view was from the West End of Ottawa looking to the North East. Figure 34 - Yep, we're still around, no reason to split. Similarly, what goes around and comes around, definitely goes around. Every now and then when you put up something good on the Internet, it comes back to you in kind. As a case in point, a notice about the Revelationnum was put up recently in a Facebook UFO Group page from Slovakia. The next day the following really good Negative pole photograph was posted in kind, proving the reader had gotten the point. Now they were pretty pleased too. Instead of having had just a interesting looking cloud photograph to look at, they now have it all making sense too. Notice the big clutch of Volume II type condensates filling the cloud at the top center and center right. Whatever the reason, this was a pretty big higher Dimensional occasion going on. Figure 35 - It's the Russians, yes? To re-iterate, the widely disparate differences in the Radionic Fields shown so far are not because of tricks of the camera but by tricks of the occasion. First, the Anchor Radionic Ships themselves come in all sizes, shapes, and figures. Second, the different types of available ionnizable water vapour reflecting the magnetic Fields at the particular time can change by the minute. If no ionnizable water vapour is present, no Radionic Cloud is visible. If a lot of ionnizable water vapour is present you might or might not see a boomer. Likewise as previously mentioned, the Radionic Ships themselves sometimes like to pull the wool or not. It is not a rigidly computable set. What you might see also depends to a degree on the local specifications of Earth's magnetic Field. And as everyone knows that's starting to change. So who knows, maybe in a couple of years these things will start coming in upside down. By now you may have also noticed that while nothing is format, everything is the same. 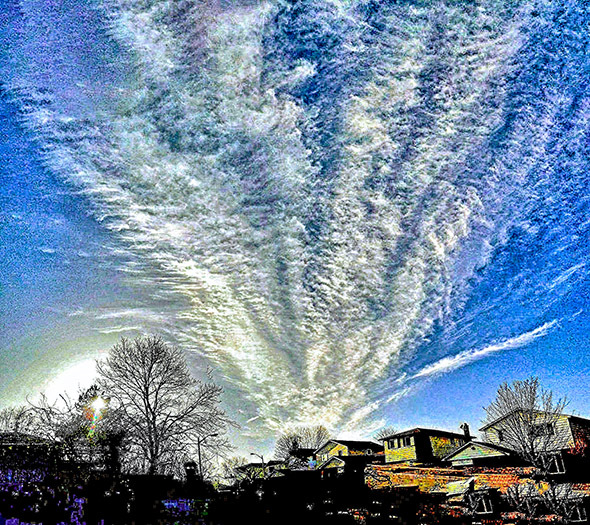 Meaning that while most examples of the Negative Polarity Radionic Fields to date look at best merely similar to any other, they are all comprised of the same type of ionnized Radionic Cloud type vapor trails. All having one or more Radial arm concentrations up the center area even if faint, all having a ball of condensation at the focal point even if minuscule, and the focal points are all about ten to fifteen degrees above the horizon even if hard to see. Hence for example, Figures 18 and 29 above are the same in Principle even as they are completely different in practice. As the following Negative monopole photograph below patently shows the Fields can differ widely from case to case. The picture was taken earlier on April 21, 2016 by the same friend of the cause as the Figure 34, this time from the East End of Ottawa looking to the South West. 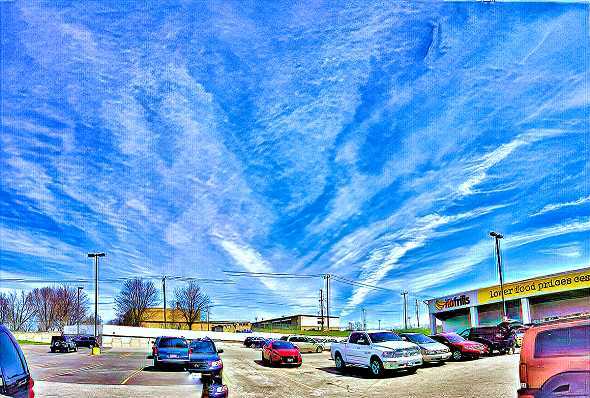 This like the others, also look about as much like a Chemtrail as 911 looked like an airplane crash. Figure 36 - The official Commission report will be out in, oh, lets say about twenty one years. Another around the World Negative pole Radionic Cloud from off the Internet is from very very far afield. This time from Beijing, China. Can't get farther afield than that. After Beijing, you start coming closer again. Beijing is known for its stunning world leading architecture. No kidding. Stunning Radionic views too from the look of things. Figure 37 - When you're awesome cool why not go all the way. To widen the horizons even more, the following photograph was taken in Sedona, Arizona. The picture is of the World famous 'Chapel of the Holy Cross' built in the fifties. Somebody certainly got something right, ust lloik at it and compare it with the little one story down the street from where you live. Likewise, somebody must have passed the word upstairs to come down and take a look because take a look again, A Radionic Cloud hanging right overhead. Figure 38 - Wonder where the people sit, where do they kneel. Where's the choir. For really around the world this time, from out of the blue came a rabbit out of the hat from the Scottish Border area, UK. The Figure below came from a visitor to the Radionicsips.com website living in Scottish Border, Scotland who said, 'Hey I have one of those'. Then sent in the following Negative pole photograph taken on September 21, 2017. Figure 39 - Looks like Brigadoon's gearing up for its next pop in. Straying farther afield yet again, the Uganda friend also sent in the following photograph, also taken in Kampala but on June 2, 2015. Some interesting things are definitely going on over there. Now maybe you know where the ancients might have gotten some of their original pictograph ideas about Space Men in helmets. Figure 40 - My name is Hal, where the heck am I. As said before, the reason there are so many photos from the Ottawa, Brantford, Paris, and Uganda areas is not occult. These are merely areas where people who are aware of the significances going on, also had a camera in hand, and also had the time and motivation to take a photo. 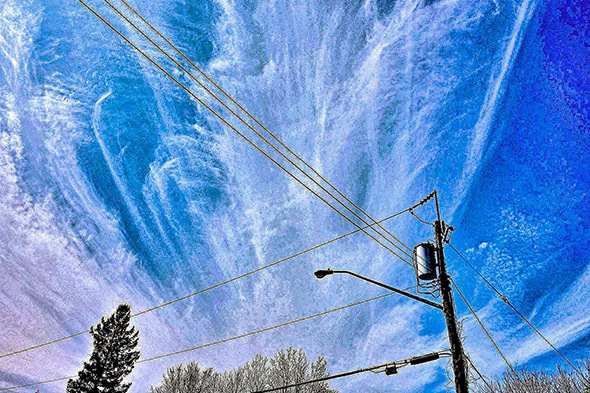 To make the point clear once again, the following Negative pole image was taken in Vancouver, British Columbia on June 21, 2011 by another friend of the cause from Huntsville, Ontario. Like most of the photos from off the Internet, the friend at the time didn't appreciate what they were looking at at the time, only that it wasn't you're normal everyday morning weatherman daily stuff. The view is looking North West out over Georgia Straight, straight out from Vancouver's inner harbor on Burrard Inlet. The cumulus clouds at the right give light to the perspective. This was a big Radionic Field. The funny thing is that Vancouver and Georgia Straight is where this word smither had his very first semi-conscious encounter with Radionic Ships. A small group had convened for an afternoon at Second Beach on the South West side of downtown Vancouver. 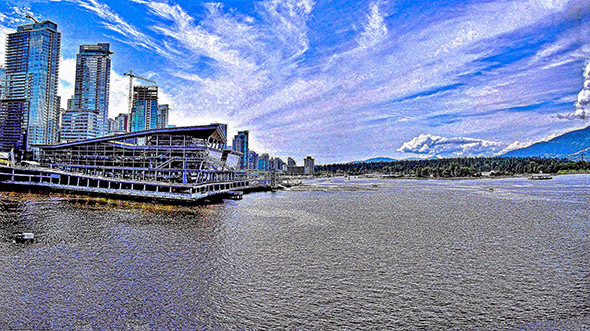 The beach is a popular Vancouver hot spot, filled with swim suit clad Bravos flexing their pecs, and bikini clad Barbies flexng their, er, pecs. The beach looks stright out over English Bay across Georgia Straight to Vancouver Island about twenty miles to the West. The mountains below are on this side of Georgia Straight. The Patriarch of the group was Radionic Ship savvy, who told us all that if we looked real sharp we just might just see a Ufo or two. This word smither had noticed, without even coming close to clueing in at the time, that the sky from one end of Georgia Straight to the other was like broken glass. Radial lines were criss-crossing everywhere in all directions. To give you an idea, envision about ten Radionic Fields like the one below all up at the same time all coming from completely different directions. Ergo, broken glass. Who could guess how many Ships were actually up there that day, with their Radionic Clouds all crisscrossing. At any rate, since everyone including this word smither was looking for metal ships humming by from pre-conceived belief, nobody saw anything and nothing was ever said, since nobody was obviously ready to know anything about it yet. It wasn't until the mid nineties that this word smither was finally brought into the loop about Radionic Clouds and that the sky in Vancouver that day had been absolutely filled with Radionic Ships all over the place. Figure 41 - On a good day I can see all the way to South America. Because of location Brantford doesn't get a lot of Northern lights, but it now gets its fair share of Radionic activity. On May 11, 2016, while driving through the Six Nations Indian Reserve just South East of Branford, the following Negative monopole was photographed out the tinted front windshield of the car by another Brantford friend of the cause. Also looking a bit like Figure 24 above, the greenish tint in the windshield converted into an additional bluish tint in the photo after processing. But the features all came out loud and clear anyway. The view was to the South West. Look around a bit, Volume II type goodies abound everywhere, particularly under the windshield, upper right, and just over the trees at the bottom left. Radionics, namely the art of being on the lookout to see what's around at any given time, is as mentioned one of the World's number one most conditional enterprises. Once you get the idea however you never doubt it. Once you see one you are a believer for life. What you see at any given time as previously mentioned, all depends on the type of Ship involved, type of water vapour present, assorted cloud covers if any, type of consciousness in the area, and of course the specific time someone sees it as the view changes inexorably minute by minute as the water vapors move on though and beyond. The first time you see a Radionic Field for yourself without having to be elbowed in the ribs, is like Chinatown at new Years. Flashes of recognition fill the brain, lots of excitement, a new understanding, and an existential voyage of discovery concluded. 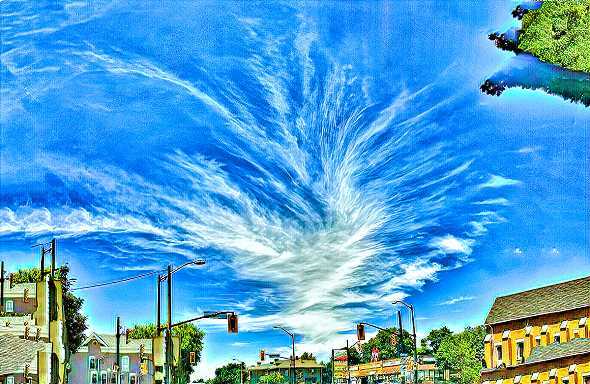 For example, even though it is a variant without peacock feathers up its sides, it is hard to doubt the credentials of the following Negative Radionic Field in the making, taken by a friend of the cause on May 30, 2016, in Toronto, Ontario. No extended Radials have yet formed. The view is looking to the North East. A half hour later it could have been all over the map or completely gone, even as the Ship itself might have been there for days and/or might continue to sit there for many more days to come. There are some neat Volume II type goodies here too, particularly the two grey blue cotton balls plus white one at the center right just above the roof top. Figure 43 - Looks great, what's the rent? An earlier Negative pole sighting in Brantford also had a lot more of the bold type arms rather than the normal feathery radials of the previous above. The photo was taken on October 29, 2015 looking to the North East. It was obviously taken in Brantford as the city water tower is sitting right up in the middle. Doahh! No ionnizations exist at the bottom left, which had been partially taken out by higher pressure air already starting to push in from the left by the time the photo was taken. About half an hour later the higher pressure area had completely passed through and the Radial ionnization effect was completely gone. Twenty minutes earlier you likely would have seen the same thing on the left as on the right. Figure 44 - Can you please explain that bit about the water tower again. 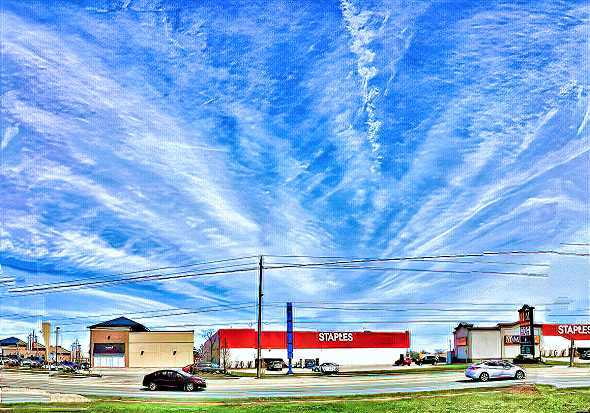 Partial views of Negative monopole Fields in the South West direction were observed on and off in Brantford, until the following much closer-in full view became visible in the early afternoon of June 5, 2016. The photo was taken in Brantford's main South end Plaza just a bit North of the reserve. The big white cotton ball at the lower left is discussed in Volume II. Figure 45 - On sale now, anything you want. Back in the Branford arena again, the following considerably pushed apart Negative Polarity Radionic Field was photographed in the early evening of November 1, 2016. It is included herein not so much because of its radiant Radionic symmetry of which there isn't a lot, but because it will be referred to in a later Starrgram to make a specific point about Contrails. The South East view has become one of Brantford's busiest directions. Figure 46 - Jeeze Louise, all I did was sneeze. A very somewhat similar example to the Figure above, shown below came from a friend of the cause in Winnipeg on May 28, 2018. That's it. Mostly because of an overcast sky and poor weather conditions, very little in the way of useful Radionic activities were sighted in the Branford area after the above. Then in mid February of 2017 all that changed abruptly when three captivating Figures of Negative pole Fields were captured. The first was on February 17, 2017. The photo was taken looking towards the North West at Brantford's South end on one of Brantford's main open air area for good viewing. A small patch of low hanging scuttering cloud covers the apex. Then, on the 5th of March, 2017 in Ancaster, Ontario just West of Hamilton just East of Branford, the second Negative pole Anchor Ship Field was noticed just as the sun was beginning to set. Unfortunately, it hadn't been noticed earlier in the day as dry air had already started moving in and had eaten up the left side and all of the bottom. Likewise, overcast was moving in quickly from the West. By twenty more minutes everything was all but gone. The view was to the North West. There is no getting around it, luck plays a big part in what you get unless you have a job on highway construction, or farm for a living. Because of a lot of overcast skies and not a lot of opportunity for the most part over the summer and fall, the next useful Negative Polarity Radionic Field wasn't photographed in Brantford until the first of December, 2017. As it hints, this one was a sizzler. Too bad the higher up layers couldn't have been well taken as well because it filled the whole sky overhead. The cotton was at the bottom is pretty well formed. Unfortunately, the Positive pole partner was only partially formed so not photographed. . Figure 50 - Pretty nice going anyway. The cotton ball of the century however was in the very first photograph ever taken on the planet for recognizing it to be a Radionnic Field. Although knowing about the Radionnic Ships since the early seventies and the Radionnic Fields since the early nineties, it wasn't until the spring ot nineteen ninety four that the buzz to take an actual photograph of one finally occurred. Like Figure 3 above, it was taken in Ottawa about six weeks earlier. Unlike the one above, this one had been an Imax with nothing masking any part, the best one of it's kind to date. The car literally pulled itself over to the curb to take the photo and thus it started. Figure 52 - 'Pick a bale of cotton, pick a bale of hey'. Then on the 16th of July, 2018, the same Brantford direction as Figure 50 produced a no holds barred, very nice Negative Pole Radionnic Field absolutely devoid of mist or haze. 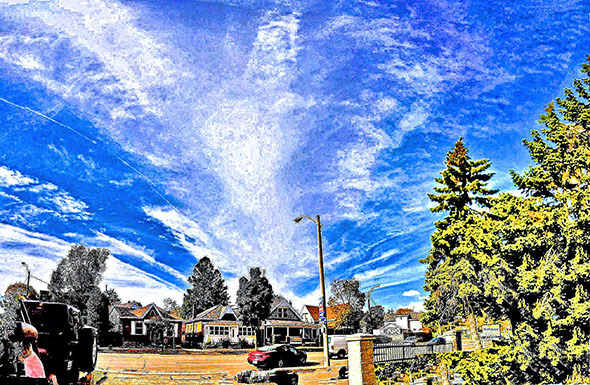 Similarly, as though to redeem itself, the view just happened to be photographed looking in the same direction about a block away from the famous pretty crummy Negative Pole Radionnic Field shown in Figure 6 above Whose only reason on the planet for being Negative whatsoever, was that its much more Positive looking partner was sitting one hundred and eighty degrees in the opposite direction at the same time. You will recall that the only reason that Figure 6 was a bonafide Radionnic event was that the ghost of a Negative Pole Radionnic Mobile Scout Ship condensate was sitting almost plain as day in the open blue area at the middle right. No such extraneous support is needed however for the image below. Figure 52 - Redeemed at last, redeemed at last, thank God Almighty, redeemed at last. 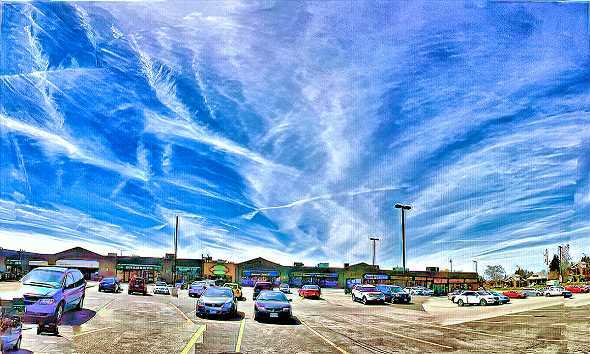 Similarly, an almost perfect Negative Pole Anchor Ship Cloud had been photographed in Brantford on September 20, 2015. Too bad the camera was tilted to the right. Figure 53 - Call it the leaning tower of Brantford.. The following photograph also looking to the North West, taken on the same parking lot as Figure 48 above was photographed after a few good snowfalls on the 26th of December, 2017. It was taken near the back of the very long parking lot. Figure 48 had been taken at the very front, hence the differences in the buildings on the right side. Figure 54 - Still looks great no matter what. Two weeks later on the 18th of March, 2017 the Negative polarity Anchor Ship Field below showed up in Branford during the late afternoon. A bit of processing power was needed with this one. The sky was fairly heavily overcast grey and only faint streaks behind the cloud cover belied that a Radionic Field was up and running. Somehow the LG cell phone camera managed to filter out much of the overcast, because the original photo from the cell phone already showed the fact of a pretty good Radionic Field in behind. A few passes through the enhancement artillery removed the rest and the picture ended up quite passably as you see it below. Nothing like the power of electrons when you need it most, like starting your car at twenty below. The view is to the North West. Figure 55 - I C U can u c me. After a dismal fall and winter of 2018 for viewings in Brantford because of mostly overcast skies, the following decidedly Negative pole Radionic Field showed up on the morning of April 29, 2018 looking to the North East.. It had slowly started out by showing grey lines out of the haze to this point, then slowly went back in. Like the Figure above, the LG5 camera plus enhancements pulled it out. So this is the best it got. Figure 56 - Hooray, at last, back in the chips again. As previously explained, Radionic Clouds form when the upper Fourth-Dimensional magnetic Fields of a Radionic Ship causes the local atmospheric water vapour in the Third Dimension to ionnize and align along the Ship's magnetic lines. The local magnetic Field of the Earth also plays a small part. As everyone also knows, well at least most of you, Earth's magnetic Field causes incoming particles from the Sun to ionnize and align along its magnetic lines the exact same way as displays of Aurora Borealis or Northern Lights as shown in the Figure below. It doesn't take an IQ of eighty million to appreciate that the ionic effects are similar. You can almost believe like the Norse once did, that the Valkyries are out on a ride. Particularly when accompanied by the sizzly whispering rushing sounds the Northern Lights make sometimes in the frigid depths of winter. Which adds to their profound mystique more than a little. Just as no sounds whatsoever add to the considerable mystique of well formed Radionic Clouds. Figure 57 - The whispering sifting ions are at it again. As the above Radionic Figures all show, many different kinds of Radionic Fields show the very same kind of Radionic effects. And this doesn't even account yet for the Positive pole ones. Also, don't forget as stated a few times already, that the winds and water vapour present the hour by hour, play a huge factor in what you see. The point is that you can expect to see anything, all similar one to another according to kind and all quite clearly representing what they are. Similarly, the preponderance of photographs from the Brantford and Paris areas may create the impression that Brantford and Paris are main stays for Radionic Ships. The fact is that there are many hubs like these appearing all over the place in countless areas around the world both rural and urban. Which could be just as busy and maybe even busier. The only difference is that nobody in these other areas are aware of the existence of Radionics yet, let alone having the motive to take photographs and exposing them on the Internet. You can also take it to the bank that these photographs above are not the only Radionic occurrences in the areas where they were taken. No doubt hundreds and maybe even more good opportunities came and went without anybody in the know being outside to see them or having a camera in their pocket. The Radionic Fleet goes about their business whether anybody is sware of them or not. The consciousness of Man is their first order of business and not becoming famous like The Traveling Manyberries. The basic difference is that a lot of you are worried that Aliens are coming to take away your stuff. The last thing in the world the Radionic Ships care about is your stuff. Their main concern is your state of consciousness, and the well being of the Planet and this Solar System's harmony with Galactic Law. And your state of mind and the well being of the Planet right now leave a lot to be desired. This is all changing now, even as you read this Revelationnum. As your consciousness moves up higher and higher in greater and greater inter-dimensional quantum jumps of understanding and acceptance, so does the well being of the Planet as a whole. And that will continue until you are all back in full inter-dimensional cognizance of how things really work in Reality, and are back in the fifth dimension from whence you fell by Luciferian misadventure three and a half million years ago. This is not a maybe, this is a fact and is in fact a significant part of what's going on. Also to an extent why the Ships are here and there is no going back. Also in part, because Earth is going to become a radiant Photostarr in the womb of Orion two hundred and fifty thousand years from now and the stage is starting to be set up today by cleaning up your messes that have been holding it back. The Ships are your benefactors and you are their beneficiary. They are not here to clean up your messes, they are here to help you clean them up for yourselves. You created the messes and you have to clean them up. That is the hard fact that has to be accepted and therein is your part to play. You are in the picture or you are out, as part of the problem or part of the solution. It is your choice to make and no one else's. Your future is in your hands alone and no one can change that for you. So stop asking Jesus or a favorite Saint to do it all for you, and stop trying to grab onto Satan's coat tails to grant you powers above anyone else. Who returned to the feet of Christ in nineteen ninety four and brought all her people with her. Who has also received absolute absolution as a Prodigal Son (Daughter) returned. She was a young third level Lanonandek Son/Daughter in training who had been duped into taking the Luciferian precepts to the Planets as Ambassador like a drug mule crossing the border, and was never really complacent.